Among Second World War miniature wargamers all around the world German elite units in general and the infamous Brandenburgers in particular are very popular subjects. Yet comprehensive English language unit histories are scarce. Therefore, Lawrence Paterson´s new book Hitler´s Brandenburgers is a welcome addition for those wargamers or history enthusiasts willing to read up on the genesis and evolution of one of the first Special Forces units in the world. Lawrence Paterson, otherwise known for his outstanding work on naval warfare, firstly outlines the original concept behind the Bau-Lehr- Kompanie z.b.V. 800 and the unit´s intended role on the battlefield. A regular combat mission would consist of capturing a strategically vital part of the enemy infrastructure such as a bridge or a railway station still intact by using enemy greatcoats or entire uniforms worn over the standard German field dress as a disguise. Also, disrupting enemy lines of communication and other sabotage missions were the Brandenburger´s mainstay. The author describes many of these combat missions from the seizure of the Sudetenland right up to the end of the Second World War in chronological order, including coastal raids and airborne drops. Paterson´s impartial portrait draws on first-hand accounts of former Brandenburgers as well as secondary sources. Throughout the book detailed Orders of Battle are presented and many original pictures in great quality enhance the story. Some maps might have been the cherry on the top of the cake but I didn´t find them to be essential to understand the story. As a wargamer and history buff I have read quite a few books on the Second World War in the past but none of them painted such vivid pictures in my head as Hitler´s Brandenburgers did. Although the author explicitly does not want to novelize the story, I found the book so gripping that I was barely able to put it down. Consequently, should you decide on reading Hitler´s Brandenburgers you will be able to play scenarios right out of the book or enhance existing ones. In addition, there is a host of inspiration for themed forces. 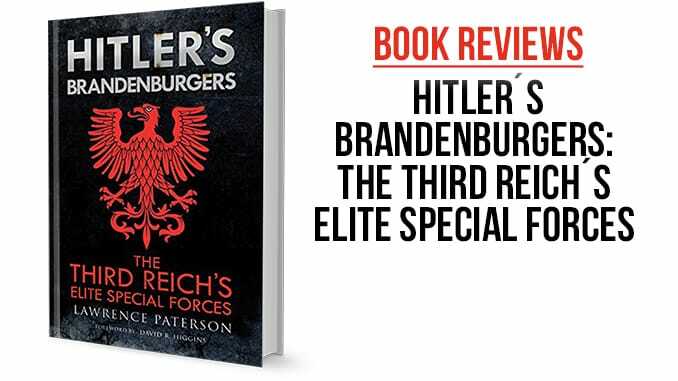 Likewise, I endorse every WW2 aficionado to read Hitler´s Brandenburgers because the book puts some prejudices and assumptions on the side and above that provides some new perspectives on the combat effectiveness and efficiency of the Brandenburgers. Altogether, a highly recommend read.